In 1986, Kramer introduced yet another budget-minded line of guitars, the Aerostar. 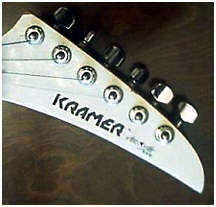 These guitars were aimed at the beginning player and were a combination of Kramer's Pacer influences and the Korean copy market. The models were four guitars and one bass. All had pointy/droopy headstocks with maple or rosewood dotted fretboards, maple necks, plywood or laminate bodies, traditional-styled trems, EMG Select pickups and black hardware. 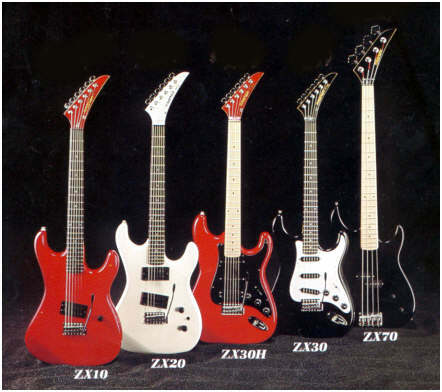 The models were named as such: ZX10, ZX20, ZX30 and ZX30H and ZX70 bass. ZX10--one slanted humbucker(Baretta style) and one volume control. Pacer type body design. ZX20--two humbuckers, bridge and neck (Pacer Imperial style), 3 way select, ne volume and one tone. Pacer body style. ZX30--Three single coil pickups in Strat formation on pickguard with five-way select, one volume and two tones. More Strat-ish type body. ZX30H--Same as ZX30 but substituted humbucker in bridge position. Strat-ish type body. ZX70--Modeled after Fender P-bass with single P bass pickup, one volume and one tone. fluorescent yellow and fluorescent pink. The Aerostar line prices were between $329.95 and $369.95 list. The line was gone by 1989.